When Hilde Back sponsored a young, rural Kenyan student, she thought nothing of it. She never imagined her quarterly donation of $15 would pave the way for Chris Mburu’s journey to Harvard Law School. Years later, Chris has become a United Nations human rights lawyer working to combat genocide and discrimination. He decides to seek out the stranger who dramatically transformed his life and is astonished to learn his benefactor, Hilde, is a Holocaust survivor. Chris replicates Hilde’s generosity by starting a foundation to sponsor Kenyan students in need, naming it the Hilde Back Education Fund. This story illustrates the fact that great things come in small steps. But it begins with the courage and conviction to take that very first step. The same is true for the pioneers of change in the CCSVI community. 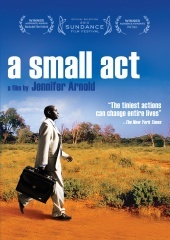 We routinely see and hear stories of everyday people that are making a difference in the lives of others in small ways. There is a wonderful proverb from Aesop that says: “No act of kindness, no matter how small, is ever wasted.” Remember that today in your own life and how MS has affected you and your family and what small thing you can do now that may, in totality, change the world.